Easter: A chance of cavities or a carcinogenic hazard? Ok, so yes, this is the day My Jesus resurrected from the dead...thank you Lord, and I'm not trying to bypass that with this topic, but since this blog is about my children and about being a mommy, I'd really like to address this issue. Does it seem like this is another holiday, that just as much as halloween, revolves around everything sweet? 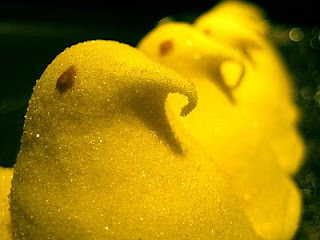 I was so excited this year about being able to buy some "peeps" for my little ones b/c they are so cute and so yummy. So I went out and bought them and to my surprise it said "Sugar-Free" I bought them and didn't think anything about it, I was actually excited that they wouldn't give my boys a sugar high. I was excited when I handed them to my boys, and when they gobbled them up with a huge smile on their faces. Well, that was, until their mouths were a bright yellow. My husband just says, "After these candies, they're all yours!" Ha ha, I just said, "It's ok, look they are sugar-free!" I pointed to the box and it read MADE WITH SPLENDA....hmmmm. Then a thought flashed in my brain. What the heck is splenda made of if it isn't sugar? "Splenda (made from sucralose) is created in the lab using a complex process involving dozens of chemicals you and I can barely pronounce - let alone consume. Basically, the chemists force chlorine into an unnatural chemical bond with a sugar molecule, resulting in a sweeter product, but at a price: a huge amount of artificial chemicals must be added to keep sucralose from digesting in our bodies. These toxic substances also prevent (hopefully) the dangerous chlorine molecules from detaching from the sugar molecule inside the digestive system, which would be a carcinogenic hazard." Hmmmm. What is the price for dental sealants for our children...something I definetly need to look into. More on sweets later, that chocolate bunny is staring at me and saying, "Eat me, Eat me!" Planning your Meals. A real money-saver! So ever since I've been married, I have tried to keep to a somewhat strict meal planner. I know it may seem a bit cheesy, "hey family, it's taco tuesday! "...lol, but believe me when I tell you I have seen the difference in our wallet. Those weeks where we just wing it, we end up buying only what we are craving and end up w/ no real meals. So before I shop I look at our 2 week meal plan and shop accordingly. I make a grocery list w/ our budgeted amount and write down my estimated price next to each item. This way I can see how much I'll be spending ahead of time. Here is an example of our menu. We tend to change it up a bit every once in a while, this is just the basics. And then of course I buy snacks w/ whatever money I have extra. I usually limit it to about $5-$10 and they are usually snacks for the boys. Well this is just my little thing that helps keep me sane and a little richer...lol. Riiiight. I challenge you if you don't already to try this and see what a difference it makes in your life.